Hosted by Jon Kulp on 2016-11-03 is flagged as Clean and is released under a CC-BY-SA license. 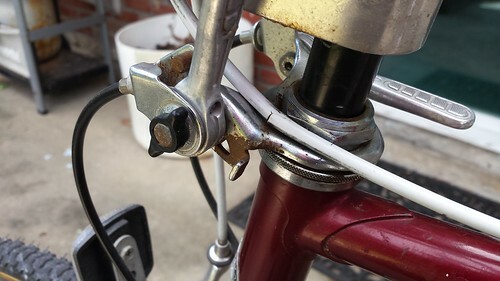 Part of my series of fixing stuff and wearing a microphone while I do it, listen along as I replace the brake cable and housing on my bicycle. For information about the tools I'm using, check out my earlier episode about the tools in my bicycle repair toolbox. Check the Flickr photo album below for pictures to go along with the narrative. Sorry I kept sniffling so much. Allergies were terrible. The church bells in the background are from Our Lady of Fatima Church, which is nearby. I remember Dave wondered about the church bells from a previous episode. I believe the name for such podcasts is "sound-seeing" as in "sound-seeing tour". I think kdmurray mentioned this in a comment on show 2111 back in September. I remember hearing this term back in the early days of podcasting, around 2005 perhaps, when Adam Curry used to record such tours for his "Daily Source Code" podcast.